This page will deal with some of the most Frequently Asked Questions (and answers) that we're asked on a daily basis and are listed in no particular order. We've invested a great deal of time in addressing common questions as thoroughly and specifically as possible (some of them may be long, but there's no stone left unturned!). You'll also find links to additional pages in the navigation menu at the top/right of this page. Of course, there's no way we can answer every conceivable question -- so if after reading this page you still have a specific question please don't hesitate to contact us. To get started, simply click on the question(s) that interests you the most to read the complete answer. ProVanax is all-natural nutritional supplement, in the form of a small capsule -- containing organic herbs, vitamins and amino-acids. The patent-pending formula is designed to help reduce anxiety, panic attacks, symptoms of depression, insomnia and irritability. Simply stated, it's designed to help improve your emotional mood and mental well being. HOW does ProVanax™ work?... What are the BENEFITS? This is known as the anti-aging, "pleasure chemical". If your libido is low, your memory is getting worse, you can't pay attention or stay focused, you're irritable - then your Dopamine is low & ProVanax can help fix this! Known as the positive attitude, "happy hormone". If you crave sugary or salty foods, or caffeine ... If you feel hopeless or unmotivated, then your serotonin is low. ProVanax will help naturally optimize this "happy hormone"! Known as the "stress" & "stomach fat" hormone. If you're under extra stress, feel like you're being pulled in too many directions and have extra "belly fat", then your Cortisol levels are high, ProVanax can help fix this! You'll wake up refreshed & energized, NOT groggy. If you have a hard time falling asleep or staying asleep, if you're worrying and thinking too much, then ProVanax will help give you a deep, restful sleep! Users of ProVanax state that they are generally happier, more confident, feel "in control", more hopeful and have an improved outlook or happiness about life. WHY is ProVanax™ BETTER than other solutions? As you know, there numerous prescription drugs that deal with "mental health" and ALL of them are addictive. And the longer you use them, the higher the dose you need because your body adapts. Then, an attempt to get OFF these drugs is very difficult and almost impossible for many people. ProVanax is all natural, not addictive and none habit-forming. It's designed to work WITH your body, and not against it - unlike prescription drugs. When compared to other nutritional supplements on the market, ProVanax performs much better because the patent-pending formula is scientifically researched and doctor formulated. Each ingredient is carefully chosen to reinforce the effects of the others. There's "synergy" ... It’s a classic example of the sum being greater than the parts! Other companies only address one factor - such as only anxiety ... or only depression. But the body functions as a WHOLE UNIT, not in individual parts. ProVanax helps heal the body in "harmony", creating a positive outcome for all users. How long will ProVanax™ last me? ... HOW MANY pills? 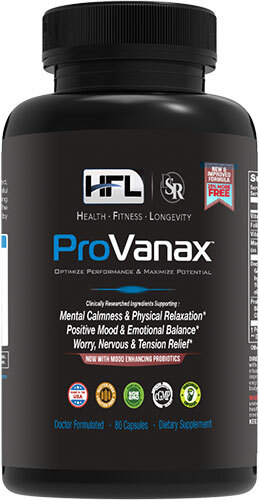 There are 60 "extra strength" capsules in each bottle of ProVanax®. Depending on your current "stress" needs and severity, a bottle will last about a month. We've setup a detailed How To Use Instructions page for you, so you'll be able to gauge proper usage, based on your life-style and stress levels. If you're not satisfied with the results, simple return the bottle for a full refund. Every product we make is backed with a 200% Satisfaction Guarantee. Why would I or anyone even NEED TO USE ProVanax™? Being healthy is not just with physical health and your body. That's important... but what's MORE important is your mental health and emotional well-being. When you are happy, in control and confident - you can accomplish anything in life. And that should be the goal and ProVanax can help. Recent research has shown that 65% of happiness is actually genetics. Some people are just born "happy" and "problems" in life, don't bother them very much. They don't feel negative emotions very often, they don't focus on "bad" thoughts, they are naturally "happy-go-lucky" people due to improved brain chemistry and hormones. And the opposite is true as well. Some people naturally worry a lot more than others. They "stress out" often. They have bad thoughts and negative inner dialog. They can't seem to let go as easily. They are stuck in the past or worry about the future... while "happy" people live in the present and enjoy life. Researchers have identified the different chemicals, hormones and neurotransmitters that control mood, happiness and emotions. ProVanax is designed to maximize the "good" and minimize the "bad". So genetically, you might need some "help" improving your emotional well-begin so you can get the most out of life and enjoy every day. ProVanax helps many people achieve this goal. To help with anxiety, panic attacks, or high stress moments, you take a higher dose and ProVanax® works its magic within 15 minutes and you'll feel calm, relaxed and confident. To help with depression, you would need to take ProVanax® twice daily and within 7 days, many people report dramatic improvements on your outlook of life, your mood and sense of well-being. To help with improved sleep and insomnia, take ProVanax® 30 minutes before bed and you'll feel a deep calm and relaxation ALL OVER YOUR BODY - not just mental relaxation, but physical too. Why happens if I STOP TAKING ProVanax™? ProVanax® isn't a drug and we do NOT want to create addicts here. The goal is to give your body the specific "nutrients" it needs to FIX ITSELF! We don't want to "mask" the problem, the way drugs do. You don't want to become numb or sedated. You want to feel HAPPY and ENERGIZED! Depression, anxiety, panic attacks, insomnia are all signs of stress (even good stress can cause problems). This leads to an imbalance of chemicals and hormones in the body and the brain. Why is this ProVanax™ better than prescription drugs? There are dozens of different prescription drugs that deal with emotional health and they all have ONE thing in common - addiction! They are all addictive and habit-forming. The longer you use them, the higher the dose and when you attempt to get off of them, there's a rebound effect and things are worse than they were before you started the medications. Granted, some people do need prescription drugs - but most people don't. ProVanax is a much better and safer solution to start with because it contains only natural ingredients, organic herbs and amino acids.It's not habit forming, not addictive. You can use ProVanax "as needed" or safe for daily use. Is ProVanax™ approved by the FDA? The FDA oversees all food and drug products. Since ProVanax™ is a natural product, it falls under the scope of the FDA. In 1994, the FDA set up guidelines for dietary supplements, and then created the Dietary Supplement Health Education Act (DSHEA). We follow all of DSHEA's guidelines. In addition, All our products are manufactured under current GMP standards as defined by the FDA to guarantee the highest degree of consistency, reliability, and potency. How is ProVanax™ shipped? And do you ship Internationally?